Talents may come and go, but a special natural born talent doesn’t come everyday. Indra Lesmana is known as the jazz icon for decades in Indonesia and he still consistantly productive. No less than 200 compositions, 18 solo albums and involved in 50 recordings have been listed in his long spanning career. Many everlasting popular songs came from his work, receiving many awards and other achievements, he’s also very popular not only in Indonesia but also internationally. All through his career he has explored many segments of music. From modern jazz, fusion, bop, mainstream, swing even nu jazz, to pop and contemporary kinds of music has met his touch. He knows how to bring an artistic value inside every song he plays or makes. Starting as early as 10 year old, Indra appeared for the first time in public in one of his father, the legendary jazz icon Jack Lesmana‘s performance. 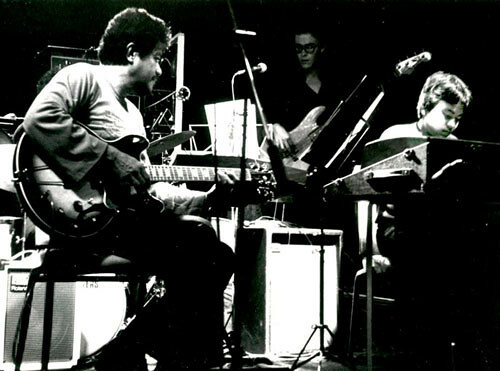 I still remember when Jack introduced him on Taman Ismail Marzuki’s stage, in Jazz Masa Lalu dan Kini (Jazz Past and Present) Concert, May 30-31, 1976. He played “All In Love Is Fair” at that time, and from there, a star has born. Being raised as the son of a legendary jazz multi-intstrumentalist and a famous singer (his mother, Nien Lesmana was very popular in the 60’s as a singer) gave him advantages besides his natural talent. He grew up listening and living with jazz. Many jazz greats at that time practiced, learned and recorded their sessions right in front of him. He made his first album, “Ayahku Sahabatku” (My Dad is my Friend), which believed to be the stepping stone of his journey in the music industry. Later when he found out that jazz would actually be his life, he got a chance to learn formally at the Conservatorium of Music, Sydney, Australia, where he got experience being taught by many jazz greats. In Australia his career was built properly with numerous music groups and famous Australian jazz musicians. His journey continued to USA. He made a couple of albums there and worked with many jazz musicians like Michael Landau, Jimmy Haslip, Bobby Shew, Vinnie Colaiuta to name a few. It was a right move, as his two albums “No Standing” and “For Earth and Heaven” went very successful, with some singles became hits on Billboard Jazz Charts and topped the charts on radios. Today Indra is busier than ever. His independent record company, “Inline Music” is growing fast, taking his time as a producer and mixing and mastering engineer. But his passion in playing music also continues on. 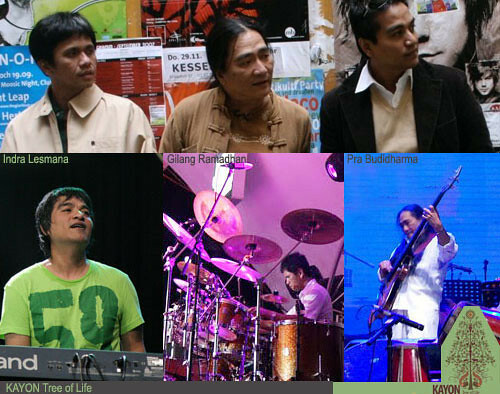 Indra is still actively playing in several groups with different colors: Reborn, Kayon (formerly known as P.I.G) and JavaJazz, and still gracing stages around the world with these groups. For some people, Indra has been off screen for quite some times, but now he’s back in sight with several headlines. Kayon is back performing really soon (October 3, 2009 at Salihara Theater Jakarta, check the info here). He’s also collected two singers from Indonesian Idol‘s each season, making them eight in total and formed “Kembali Satu”. And here’s the other big news: JavaJazz is back! 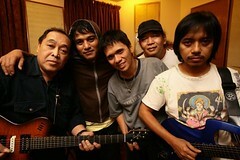 Ever since the saxophonist Embong Rahardjo passed away, the group was on hiatus for several years. But now a breakthrough in the lineup was made by replacing Embong with two guitarists that bridges two previous formation of JavaJazz. And they rise again, getting even better than ever. With these many headlines, we knew we really had to interview Indra and asked him all about these. An interview was made, and let’s get deep with Indra Lesmana! First of all, we are so happy to see you back again in the recordings. Not just back but get involved in two groups at the same time. Can you share us a bit what has been keeping you busy that somehow you seem to be “disappeared” from the recording world? After releasing “KAYON Tree of Life” at the end of 2007, my wife and I decided to give more attention to our recording company, InLine Music. At the beginning of 2008, we moved and built our new recording facility in Deplu area Bintaro, Jakarta We helped some projects in mixing and mastering, like Ligro Trio, Maliq & d’Essentials and many others in April 2008. 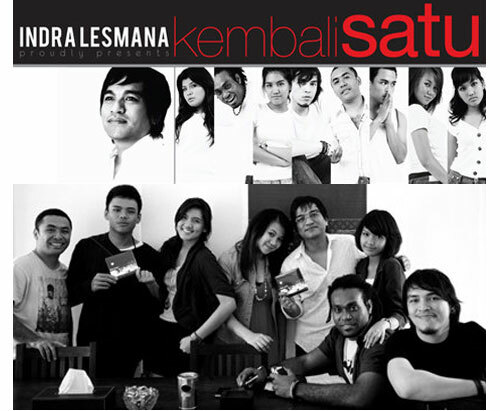 In July 2008, the project of “Kembali Satu” album was begun, while at the same time I still helped my friend’s projects. Those proof that I have never disappeared from the recording world. Alright.. but now we know your name has appeared again on two groups, “Kembali Satu” and “JavaJazz”.. First let’s talk about “Kembali Satu”. What’s the concept? The idea of “Kembali Satu” came up in the middle of 5th season of Indonesian Idol. At that time I felt there were many talents from Idol that should deserve the chance to do something in Indonesian music industry. But they never got it the way I hoped.. Well, then.. I thought, “why don’t Inline Music do it?” Then we selected 8 singers, two from each season that I personally picked up to join together in one album. (Nania and Micky from the first season, Monita and Glenn from the second season, Nobo and Teza from the third season, Gaby and Marsya from the fourth season-red). So here are the 9 of my songs including two new songs that we thought would suit the character of the 8 vocalists we selected. It took a long time to make this album due to some technical difficulties we faced during the process and besides I also wanted each song and vocalist has the same strength between them. I wanted each singer really enjoy the song they sing and give their best performance. Since we met very often, I make “Kembali Satu” not only as a project of making an album but also as a media of learning music and how to produce an album independently. Now let’s talk about JavaJazz. For us, JavaJazz is one of the milestones in our music history especially through the braveness to appear in free exploration with ethnical nuances, but still without any difficulties for us to digest. What made JavaJazz disappear from the jazzy world for several years? 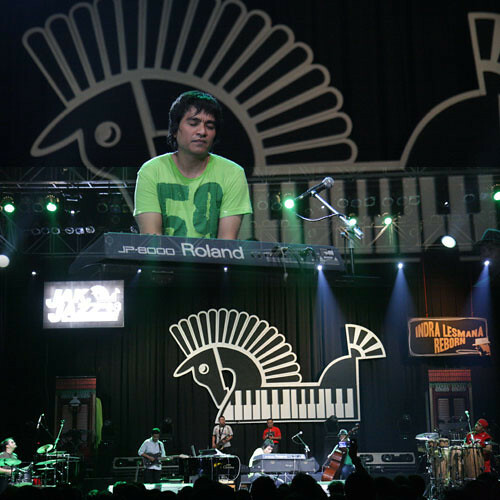 In JavaJazz music, the performance and talent of the late Embong Rahardjo was a very important element that became the strength and type of JavaJazz itself. Honestly we suffered a great loss when he passed away, especially the fact that it happened when we just decided to go back to the first formation in “Sabda Prana”. On one occasion we played in quartet without Embong Rahardjo in a tribute to him in 2003. After that night’s performance, we realized something was missing in our music, and that was the reason why we decided to put JavaJazz to sleep. Then now JavaJazz wakes up again with really solid formation consists of senior jazz greats. (Indra Lesmana on keyboard, Donny Suhendra and Dewa Budjana on guitar, Gilang Ramadhan on drums and A.S. Mates on bass). Can you share us the process? Frankly speaking, the willingness to play music again in JavaJazz has never faded away. At the beginning of 2007, I ever wanted to gather my friends in JavaJazz to discuss the possibility to hold it again but unfortunately it never did. But huge emails from friends and fans kept coming to support me and that made me have great strength to bring JavaJazz back again and finally that moment has come true this year. One of the songs that impressed me most is “Bulan Di Atas Asia” (Moon Over Asia). Can you share us a little about that song? I composed “Bulan Di Atas Asia” in 1988 with the title “Moon In Asia”. At that time I really wanted to make a composition using pentatonic scales from different sides of Asia. This song firstly appeared in a concert at Gedung Kesenian Jakarta, and soon the song became one of the signature compositions of JavaJazz. It’s really interesting to have the decision to use two-guitar formation that seems like bridging the two previous formations, the first one with Dewa Budjana and the second one with Donny Suhendra. Is this an alternative to cover the loss of Embong Rahardjo on saxopone? I mean, does the chemistry with Embong can never be replaced with another saxophonist or it’s the concept this time that need no saxophone with? Chemistry is one of the most important elements in collaborating. I felt this chemistry with Dewa Budjana since long time ago, from EXIT (1987) to JavaJazz (second formation, 1994) until I took part as the producer for his first album, “Nusa Damai”. Budjana has also been familiar with almost all compositions existed in JavaJazz and played them all nicely. But above all, I still can’t think of any other musicians that can play flute, piccolo and saxophone the way Embong did. I also see Budjana play guitar sound in more variation, like mandolin, banjo and any other of his guitars. This is really beneficial for the need of JavaJazz music concept since it does need rich variation of sound element. By using the new concept with two guitarists, will there be any new color with this most recent formation? Of course there will be a little difference on the music concept with the two guitars, but the true color of JavaJazz will still be there. But If you want to know how exactly the concept this time, you really have to wait until “Joy Joy Joy” ready to launch haha.. I got bliss when I looked at the newest formation. It looks very solid with some of the best Indonesian jazz musicians joining in. What do you think of this formation? We all feel very happy and comfortable with this formation…it feels very solid and better than I could ever imagine. With the re-appearance of JavaJazz and also your project Kembali Satu, how about your other project, Reborn and Kayon The Tree of Life? Will you still continue to present in these two groups? Reborn and Kayon will still run. As a matter of fact, soon Kayon will perform again at Salihara on October 3rd. As for Reborn, we will enter the studio for recording sometimes in the middle of next year. Cool! Speaking of Kayon, the exploration rooted deeply on ethnical nuance, and if I may say, it’s really brave for you to go against the market trend. Your collaboration with the other two ethnical jazz greats has made a phenomenal group. Why are you interested in exploring these pure Indonesian ethnical music into jazz? I mean, what’s the concept you want to deliver with Kayon? Kayon was born through a continuous concept that I always want to build through my journey with Pra and Gilang. We have been together for long, and this trio is always evolving. Since the progressive fusion at the end of 80’s, then the improvised music at the end of 90’s. When I got an offer to perform in Berlin in 2007, I felt it was the right time for this trio to explore the richness of our authentic musical culture in the spirit of modern jazz.. and then, when we came home from Berlin, we decided to end P.I.G. era and continued our music concept under Kayon. In fully respect to your dad, Jack Lesmana, let’s talk about the past for a while. As far as I recall, your first appearance in public was when you were still 10 year old, on your dad’s concert. And what an amazing debut it was. You were superb on the piano. What made you become the jazz pianist first of all? The process to be able to play piano at such a young age like that was actually unique. At that time I didn’t think I learned seriously. It’s like, all of a sudden I loved listening to jazz and tried to play the songs with the piano we had at home. One day my dad caught me trying to play blues on piano, and ever since that time I never stopped playing jazz and learned intensely with him. Can you give me a picture of how Jack Lesmana taught you at that time? How was his support, how he provided the facilities, and so on.. I was raised at a music house of Jack Lesmana. That means, besides he’s my dad, he got a studio and music community at home that always on, 24 hours a day.. Besides learning formally with my dad, I also raised in such an environment with his friends that practiced, studied and recorded their sessions with him. You have a long spanning career, with many great achievements both locally and internationally. How do you see the growth of our music from your own perspective? Oh well.. actually it would take very long to describe it, because there are so many to talk about, and I have many discontent for this topic. Well, basically, apart from the unidealistic situation created by the television to support the music development in Indonesia, I feel satisfy enough to see there are still many young jazz musicians and also independent musicians that has enough courage to keep on making music and grow their ability. Now let’s talk about InLine Music, your record label. How far has it helped you in this music business? I feel really thankful for having and running Inline Music as an independent record label. Now finally I have a place and source to build my music more consistantly. Of course this would never happen without the multiple talents possessed by my wife, Hanny. The last question, what is your plan in the future? I will keep on playing music with all my groups (Kayon, JavaJazz and Reborn), and as a producer, me and my wife will keep on producing for Inline Music. I’m also going to concentrate of teaching again, by giving clinic/workshop and masterclass, eventhough I can only focus on this some times in the middle of next year. Other than that, I just improvise! !